On the European side of Istanbul, just one kilometer away from Maslak, one of the main business districts of the city, there is a lovely place to spend some time in greenery: Emirgan Park. It overlooks the Bosphorus in the suburb of Emirgan. It is one of the largest parks in Istanbul. There are lovely gardens, a grotto, fountains, quiet picnic areas, and three former Ottoman pavilions (they are in use as restaurants now) in the park. In Byzantine times, the area was covered with cypress trees, and known as “Kyparades” or “Cypress Forest”. And by the mid-16th century, when the uninhabited land was granted to Nişancı Feridun Bey, a Lord Chancellor in rank in the Ottoman Empire, became known as Feridun Bey Park. In the 17th century, Ottoman sultan Murad IV (reigned 1623-1640) presented the estate to Emir Gûne Han, a Safavid Persian commander, who surrendered his sieged castle without any resistance, and followed him back to Istanbul. The name “Feridun Bey Park” was changed to “Emirgûne”, which in time became corrupted to “Emirgan”. During the centuries, the estate’s owner changed several times, and by the end of the 1860s, it was owned by Khedive Ismail Pasha (reigned 1863-1879), Ottoman governor of Egypt and Sudan. The area was used as the backyard of a large wooden “yalı” that he built on the shore of the Bosphorus. Further, he built within the park area three wooden pavilions, which still exist. The heirs of the Khedive family sold the estate in the 1930s to Satvet Lütfi Tozan, a wealthy Turkish arms dealer, who granted the park grounds, the three pavilions included, later in the 1940s to the City of Istanbul during office of Governor and Mayor Lütfi Kırdar (1938-1949). Today, Emirgan park is owned and administered by the Metropolitan Municipality of Istanbul, covers an area of 117 acres (470,000 m2) on a hillside, and is enclosed by high walls. Inside the park with two decorative ponds are plants of more than 120 species. The Yellow Pavilion (Turkish: Sarı Köşk) is a large wooden mansion in the form of a chalet built by Khedive Ismail Pasha between 1871-1878 as a hunting lodge and guest house. Situated in the center of the park and overlooking the Bosphorus, the two-storey mansion with one balcony, one terrace and a basement is constructed on an area of 400 m2 (4,300 sq ft). It consists of four rooms, one hall and a kitchen in the lower floor and three rooms and one salon in the upper floor. Its layout reflects the architecture of the traditional Ottoman house with a salon encircled by many living rooms. The ornaments at the ceilings and the walls were the work of the court architect Sarkis Balyan. The ceilings are enriched with oil painted flower figures and the facades with outstanding carvings. The high doors and windows, as well as the opulent interior decorations in bright colors reflect the glory of that era. A pond is situated to the northeast, next to the mansion. Used only by the owners from the very beginning, the pavilion was restored within four months in the beginning of the 1980s with due diligence, furnished with antiques and opened to the public as a cafeteria. The Yellow Pavilion, the main base of the park, is run since 1997 by Beltur, the tourism company of the Metropolitan Municipality of Istanbul. The Pink Pavilion (Turkish: Pembe Köşk), one of the three mansions in the park built by Khedive Ismail Pasha, is a two-storey, typical Ottoman house. Named after its exterior’s original color of cranesbill flower pink, the pavilion reflects the glory of its history with fine ornaments. The pavilion is used as a cafeteria on weekends. Furthermore, it available for conventions and wedding ceremonies. The White Pavilion (Turkish: Beyaz Köşk) is the third mansion within the Emirgan Park built by Khedive Ismail Pasha. It is only 150 m (490 ft) far from the Yellow Pavilion. The two-storey wooden building bears the architectural characteristics of the neo-classical style. The mansion is used in the daytime as a cafeteria and in the evenings as a restaurant of Turkish-Ottoman cuisine. The Emirgan Park is closely associated with the tulip, the traditional flower, which gave its name to an era (1718-1730) of the Ottoman Empire. 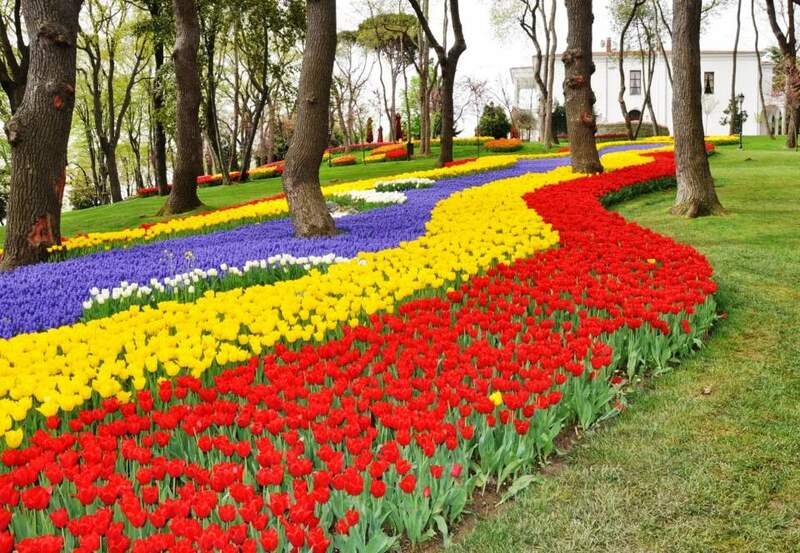 A special garden was established in Emirgan Park in the 1960s to revive the city’s tradition of tulip cultivation. Since 2005, an annual international tulip festival is organized here every April making the park attractive and very colorful with these flowers. How to go to Emirgan Park? You can get to Emirgan Park by ferry from Bebek or one of the buses that follow the route up the European side of the Bosphorus. From Kabatas you can take buses: 22, 22RE, and 25E. From Taksim or Besiktas: 40, 40T or 42T. If you tell the bus driver where you are going when you get on the bus he will let you know when you have gotten there. Another alternative is: you can go to Maslak (ITU-Istanbul Technical University Campus station) by subway, then take the bus 40B. You can also walk there from Maslak (around 1 km).